Every nation on earth has agreed to abide by a historic 31-page climate deal. The signing of the climate agreement in Paris signals the start of globally coordinated efforts to reign-in climate change. History will record that the deal was signed at the 21st Session of the Conference of the Parties to the United Nations Framework Convention on Climate Change (COP21) on December 12, 2015. There are a number of imperfections in the Paris agreement, not the least of which is the fact that the submitted INDCs will not prevent the earth from warming more than the internationally agreed upon 2 degree Celsius upper threshold limit. However, as UN general-secretary Ban Ki moon said, perfection is the enemy of a climate agreement. Some are disappointed that there was not more financial support for vulnerable nations. Others are disappointed that the agreement reiterates the 2 degree Celsius (3.6 degrees Fahrenheit) upper threshold rather than focusing exclusively on the 1.5 degree Celsius limit that was supported by many nations including the US, Canada, China and the EU. Although 2C remains the outside limit nations did agree to “make their best efforts” to keep global temperatures from rising more than 1.5 degrees Celsius. Thanks to Republican obstructionism, the targets that countries take on will not be binding under international law. However, other aspects of the deal are legally binding. While the agreement is less than perfect, it is nonetheless a historic achievement that gives us reason to believe that the world may finally tackle the climate crisis. More than ever before, the Paris agreement shows that we have the will to engage. It is naive to have expected that COP21 on its own could have produced a final agreement that would have definitively ended climate change. The deal demanded compromises, nonetheless we have taken a massive step forward. 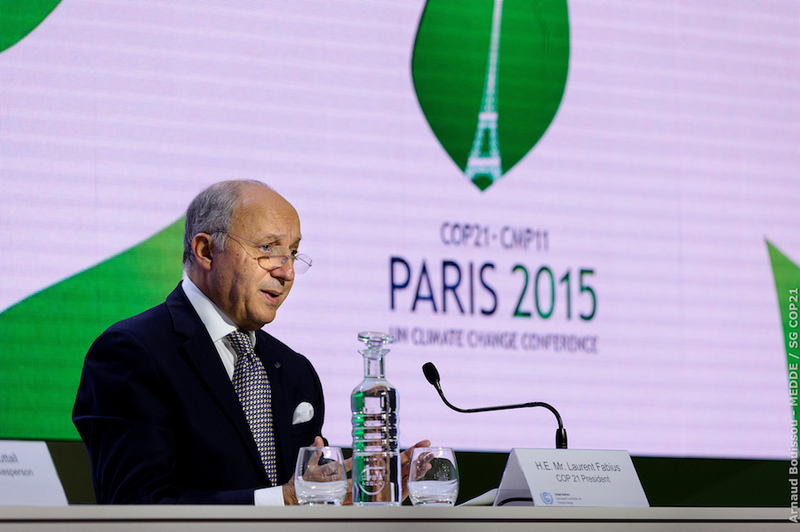 Failure to produce an agreement would have squandered the momentum of COP21. The outcome is an objective reflection of how far we have come. It will also galvanize support to further the process. The Paris deal should not be cast as a baby step forward, it is a gargantuan leap that buoys our hope that we can prevail. Despite this great achievement, the deal has attracted the attention of a number of critics. As explained by US President Barack Obama long before the deal was signed, cynicism is the enemy of climate action. “One of the enemies we will be fighting at this conference is cynicism – the presumption that we can’t do anything about climate change,” he said. Modern day Marxist revolutionary Naomi Klein is a COP21 cynic on steroids. She did not wait for the deal to be signed to launch into a tirade. As we were on the cusp of signing the most important climate deal in history, she railed against the deal and amplified her calls to overthrow the capitalist system. The only thing that is extraordinarily dangerous is Klein’s contrarian whining. As a leading voice of the revolutionary narrative, Klein is dangerous because pessimism undermines environmental advocacy. James Hansen is a great man, he has been a stalwart champion of climate action and for this we should all be grateful. He has a better grasp of the science than almost anyone so we should listen when he sounds the alarm about such things as the inadequacy of the 2C upper threshold limit. However, the former NASA scientist holds curmudgeonly views on COP21. His take may be born out of his passionate convictions, but it is patently untrue and ultimately destructive to popular support for the climate movement. Although it may not be his intention, his comments provide fodder for those who seek to derail political action. In the past he has quite rightly launched scathing attacks against leading Republicans, but his attacks now include President Obama who has done more to advance climate action in the US than any American ever has. Hansen is undeniably one of the world’s leading climate scientists and a powerful activist, however, his failure to understand the political and psychological realities at play in the war against climate change harms the broader cause. Rather than criticize, we should take a brief moment to appreciate the scale of this unprecedented accomplishment. Millions signed petitions and on the weekend before the talks, hundreds of thousands took to the streets to call for an ambitious deal. People wanted an agreement and world leaders delivered. The COP21 deal has achieved the goal of setting verifiable commitments to reduce greenhouse gas emissions and it has established rules for how countries monitor and report their emissions and reductions. In short, we have an international agreement that was signed by 196 countries that will limit the global temperature and hold governments to account. Despite these challenges and even a terrorist attack, a deal was forged. Not only did the Paris agreement meet expectations, it exceeded them. One of the most important dimensions of this deal is the message that it sends to the private sector. The end of the old energy economy is now in sight and the low carbon economy is here to stay. Businesses will need to prepare for a raft of government regulation and those companies that have already invested in sustainability stand to reap lucrative dividends. As reported by the Guardian, Jennifer Morgan, of the environmental think tank the World Resources Institute, said the long term goal was “transformational” and “sends signals into the heart of the markets”. The Paris deal will expedite the demise of the fossil fuel industry and invigorate investment in renewable energy. This is a clarion call and both large and small investors will need to review their portfolios. This seismic shift was confirmed by the International Investors Group on Climate Change, a network managing €13 trillion of assets. They said they expect to see movement away from fossil fuels and and towards renewable energy. The Paris deal is only the beginning. “It’s not the end of the fight over liability, it’s put the polluters on notice and that fight will continue in other fora,” said former US Vice President Al Gore. The new agreement includes provisions to ratchet up national ambitions over time. “Paris has to be a catalyst. It’s in no way, shape, or form a final chapter.” said Derek Walker, associate vice president of global climate at the Environmental Defense Fund. After most world leaders left Paris, president Obama stayed behind and worked towards legally binding periodic reviews of each country’s emissions reduction targets. As part of the final COP21 deal, nations have committed themselves to reviewing their national emissions reduction pledges every five years. This prompted Miguel Arias Cañete, the EU’s climate commissioner to say that we can build on this historic deal. This Paris agreement specifically asks governments to periodically strengthen their emissions reduction pledges in order to meet and exceed the goal of keeping temperatures below the 2C upper threshold limit. The agreement is both a first step and the turning point for our efforts to curtail and ultimately eliminate greenhouse gas emissions. “This means bringing down greenhouse gas emissions to net zero within a few decades,” said John Schellnhuber, director of the Potsdam Institute for Climate Impact Research, and a climate adviser to the Vatican. The deal should be scrutinized, but let’s take a moment to appreciate that we are about to take the first bold steps towards a carbon free future.